We, typical for the summer period, give out concerts mostly at festivals and Open Airs, and they will keep updating in our schedule. For the time being, we will give a preview of the most interesting upcoming shows. 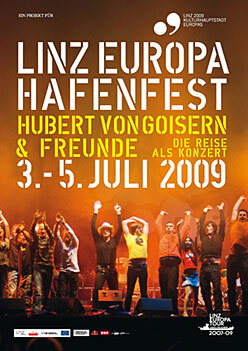 The grand finale of “Liz Europe Tour 2007-2009” will already take place this summer. In the third summer of the tour all the artists who stayed in Hubert von Goisern’s “floating village” will meet in Linz, the Europe Capital of Culture 2009. During a three day festival the multi-voiced musical cargo of the tour will be unloaded. We will be concerting with Hubert on the 5th July on one stage – this time it won’t be a ship stage, but a port stage! 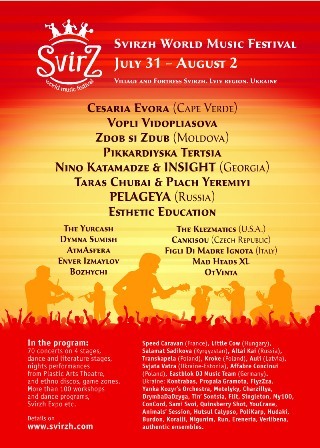 Svirzh Festival - the biggest Ukrainian World Music Festival. The program includes concert stages, theatre, dance, literature etc. The Village and Fortress Svirzh are in 40 km way from Lviv, western capital city of Ukraine. This year Lviv was proclaimed as the main cultural centre of Ukraine. At the same time it is one the oldest and multiethnic cities of Europe. We will participate on August, the 1st on the main stage. Let’s rock-n-roll! Check out the upcoming events schedule on our site!